Hardwood replacement signs range from all-too obvious to very slight and subtle. However, most of the time, it’s not too difficult to tell when a floor is coming to the usable end of its life. In most instances, hardwood is salvageable and refinishing is a viable option. However, just because hardwood is able to be refinished, doesn’t mean it’s the right choice. Now, if it is time to replace hardwood, then you might well change things up a bit. After all, you don’t have to install new hardwood flooring to replace the old one. Perhaps the most viable alternative is engineered flooring. It comes in a wide variety of colors, textures, and styles. (It’s even possible to find tile that looks like hardwood.) Or, go with tile. Here again, tile comes in a huge variety. Of course, you can also go with an alternative like pergo or another product. Obviously, there are instances when replacement is the only real solution. Therefore, you should be in-the-know about what constitutes a necessity. In other words, it’s best to do small repairs or just refinish hardwood instead of outright replacement. Separation. Temperature and moisture fluctuations can wreak havoc on hardwood. Over time, these two factors can cause the boards to gap and separate. If you see gaps and they don’t close during summer, replacement is probably the fix. Deep gouges and thickness. 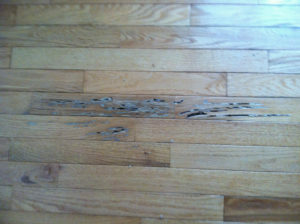 If a hardwood floor is littered with deep gouges, it’s often better to replace than refinish. Another consideration is how thick the boards are and the viability of removing another layer. If the floors have been refinished several times, replacement is a good choice. Cupping and crowning. Cupping occurs when the edges turn up and the center stays down. Conversely, crowning is the opposite — the center bows up and the edges stay down, in-place. Either way, cupping or crowning, both are bad and will only worsen over time. When you need remodeling debris disposal, just phone 800-433-1094 or visit Junk Garbage Removal.